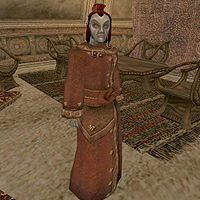 Guls Llervu is a Dunmer priest who sells books, ingredients, potions, spells, and spellmaking services from his small house inside the Redoran Council Hall, Ald'ruhn. He is a member of House Redoran, but will provide his services to anyone. Of note to alchemists, Guls is a restocking vendor of Corkbulb Root, Kagouti Hide, Resin, Saltrice, Scathecraw, and Scuttle, and will always have five of each in stock. He stocks mostly healing potions, and will always have a supply of low-quality Restore Health and Cure Poison potions. Among the books he has in stock is 36 Lessons of Vivec, Sermon 27, a Speechcraft skill book. He wears an extravagant robe and shoes. Aside from his natural resistance to fire and the sanctuary provided by his ancestors, he knows a selection of spells from the schools of Illusion, Mysticism, and Restoration. Specifically, these are the same spells that he has for sale.